This strawberry cake is baked with a simple buttery crumb topping. This is an easy and delicious way to enjoy fresh spring strawberries. The crumb topping can be made with or without chopped nuts, or add some toasted coconut to the topping mixture. In a mixing bowl, whisk the milk with the egg and melted butter. Add the dry mixture and beat for 2 minutes. Spoon the batter into the prepared baking pan and spread evenly. Top the batter with the sliced strawberries. Combine 1/2 cup flour and 1/2 cup sugar; cut in butter until mixture resembles coarse crumbs. Add chopped pecans or walnuts, if using. Sprinkle the crumb topping mixture over the strawberries. Bake in the preheated oven for 30 to 35 minutes, or until a toothpick comes out clean when inserted into the center of the cake. If you want more of a dessert cake, this frosted strawberry cake is excellent. 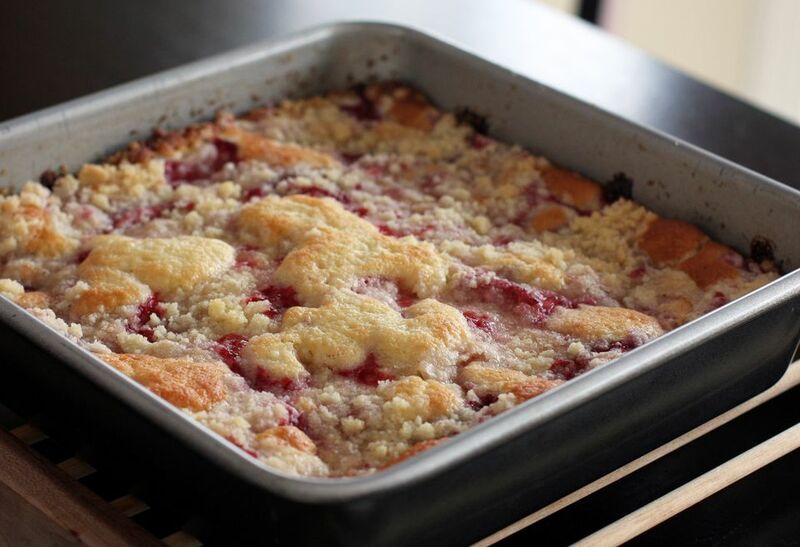 Or bake this strawberry rhubarb crumb cake or this strawberry shortcut cake.